Nothing says spring like a class held outside. 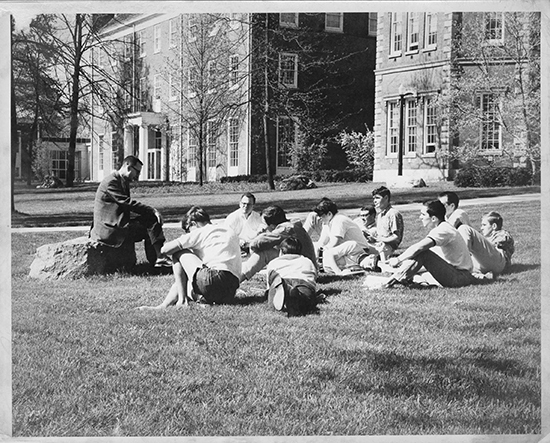 This image is of Don Baker and his class out in front of Center Hall on a beautiful day. It looks like this is a day fairly early in the spring. The trees are just coming into leaf and the blossoms on the trees are ready to open. This picture appeared in the 1965-66 yearbook. This is just a great picture of a scene that has happened here hundreds (thousands?) of times and still happens from time to time. When a warm, sunny day tempts the prof. outside, it seems a little magical. A bit of a throwback to the ancient teaching ways. The learned elder shares the wisdom he has accumulated over a lifetime with the youth of the village. In this case the elder is Don Baker and the village is Wabash College. Don Baker was a poet and a highly regarded member of the English faculty at Wabash from 1953-1987. A new building for the sciences. 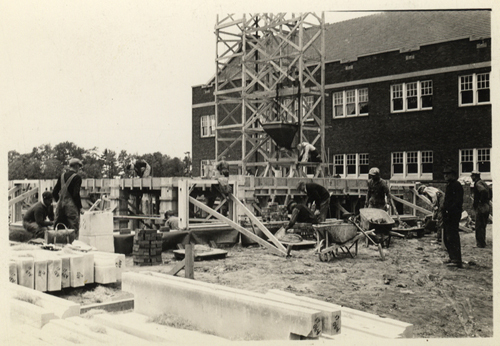 Now that I have my architectural history hat on my head…I came across these photos of the construction of Goodrich Hall. There are several small photos taken, I believe, by a student. This is a great picture of the area before Goodrich. It is also a nice look at the Armory when it was not quite 20 years old. The construction shed has arrived. The tidy little stacks along the walkway are evidence of another project in progress. At this same time, the path from the west to the east side of the mall was being bricked for the first time. Although it is hard to see in this small image, the sidewalk has been excavated in preparation. The installation of brick sidewalks and the brick walls between Goodrich and the Armory were a pet project of Trustee Ike Elston. He was really passionate about decent sidewalks on campus. 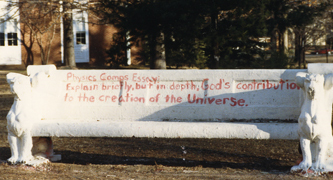 He gave the money for the project and must have greatly enjoyed putting his rather permanent mark on the campus. The foundation goes in and the scaffolding goes up. This appears to be a cornerstone ceremony. Near the cornerstone is President Hopkins and beside him is Dean George Kendall. 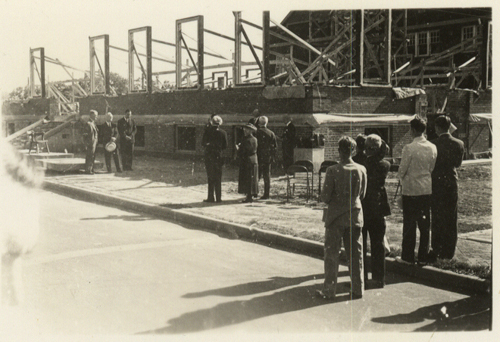 Among the three men at the left in the picture is the President of the Board of Trustees, James P. Goodrich, who gave the money to build this science building. 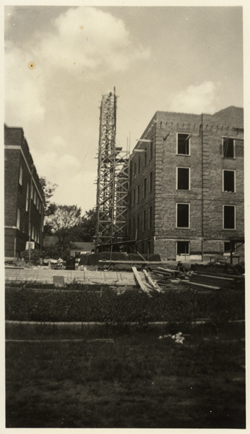 The view from the south as the building rises. I should add that this picture includes both buildings on campus by architect Jens Frederick Larson. They have the same New England flavor. Many consider this the prettiest corner of campus. First the Chapel then Goodrich were designed for Wabash. 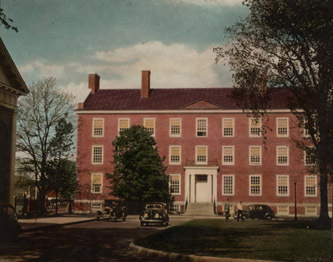 Larson was an architect of note in New England and did a number of buildings for the Dartmouth campus. That Wabash would use the same architect that had done such good work at Dartmouth is not a coincidence. Earlier I mentioned President Hopkins who was our president from 1926 to 1940. In one of those oddities of history, Dartmouth’s president at this time was also a Hopkins. Ernest Martin Hopkins, brother of our man, was the president of Dartmouth at this time. One can imagine the brothers chatting about their mutual building projects. 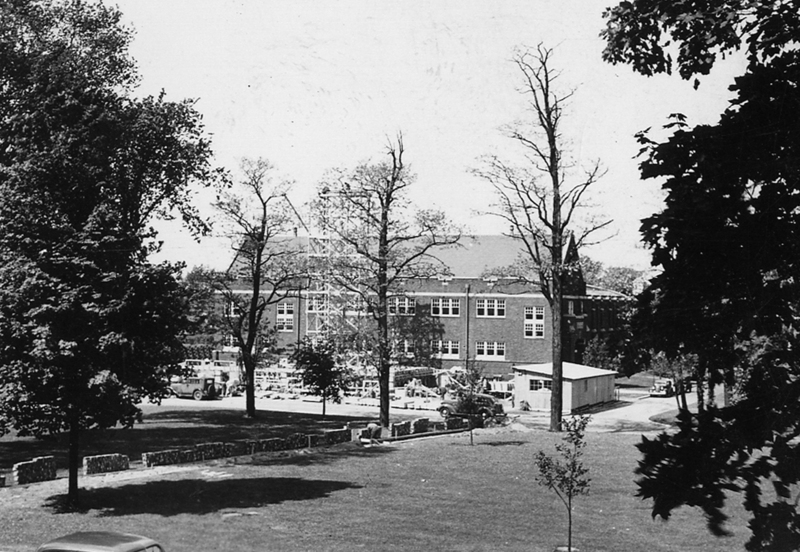 Larson did a campus plan for all of Wabash which included new dormitories, a massive renovation of Yandes that would create both a student union building and an expanded Library. Unfortunately, the Depression got in the way. All that was ever realized from these plans are these two lovely buildings. And, as you might imagine, Goodrich was a marvelous addition to the campus. I have been thinking about the Sparks Center a lot lately. But before it was the Sparks Center, it was the Campus Center. When it opened in 1954 the Campus Center offered bowling in what is now the Little Giant Room and pool tables in what is now the Bookstore. This cover from the Indianapolis Star Magazine is from October of 1954. President Frank Hugh Sparks is in the foreground chatting with a couple of students. One of the most interesting bits of history connected to this building is its architect. Designed by Eric Gugler, a nationally prominent architect, the Campus Center made quite a splash among the students. Some students enjoyed the new luxuries but not everyone on campus appreciated the new building. Many students and some members of the faculty felt it was far too fancy for “Old Wabash”. Gugler created much of the look of our campus today as the architect of the following buildings: Waugh Hall, Campus (Sparks) Center, Wolcott and Morris Dormitories, Lilly Library, parts of the Allen Center, and Baxter Hall. Gugler had many high profile architectural commissions. 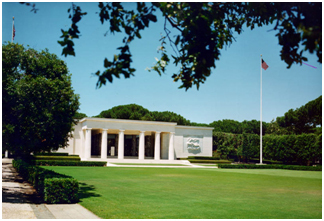 He designed the Teddy Roosevelt memorial, a 91 acre park on an island in the Potomac River, in Washington, D.C. He did a building for the New York World’s Fair of 1939. He was active in the earliest preservation efforts and was a founding member of the National Trust for Historic Preservation. Gugler makes a fascinating, and direct, connection between Wabash and the West Wing. 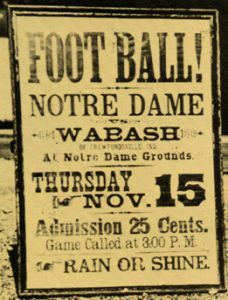 Wa­bash beat Notre Dame on the University’s home field – an achievement which no team would repeat for twenty-four years. The win was no fluke, no miracle… (Coach) Cayou’s boys demonstrated The Chief’s oft-repeated statement that ‘a real will to win cannot be denied.’ Besides the glory of having beaten Notre Dame on its home field (an achieve­ment highly regarded by all opponents before and since) Cayou’s Little Giants had another distinction. If that was not the first football game to be broadcast in Indiana with visual effects to an absent audience, then some authority should come for­ward with irrefutable evidence to prove otherwise. These two scans are of the old Phi Delta Theta house. The top image is the older of the two and really show the house as it was when it was a family home. 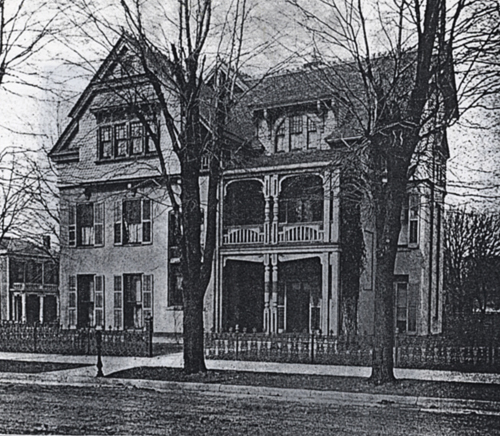 The Goltras lived in this house and sold it to the fraternity in 1903. We can see the iron fence and the Victorian embellishments on the porches. 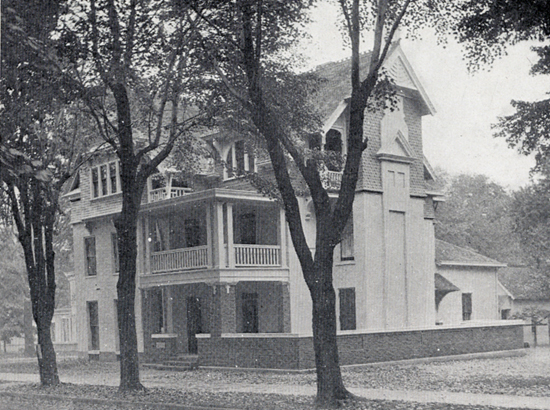 Looking at the left of the picture we can also see a rather handsome home where the Kappa Sigma addition was built several decades later. In the second picture we see how the home began to morph into the old Phi Delt House of more recent memory. The building is beginning to lose its fussiness and is becoming a simpler structure. The brick patio was added and we can assume that the students are now living here. It was this house that was used as the College Infirmary in the influenza pandemic of 1918. The Phi Delts rented the house to the college for $624.86. It served many young men very well. In fact, no students died on campus as a result of this killer flu. The only casualty was a young nurse, Miss Edith Newell. She had been nursing in Terre Haute when she contracted pneumonia. Miss Newell came home to rest and convelesce and was well, or so she thought. 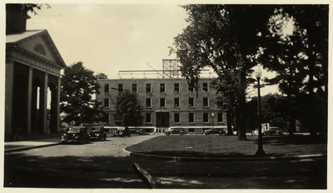 She responded to the call for nurses for the influenza students of Wabash. I suppose that today we might say that she had a compromised immune system. At any rate, Edith Newell caught the flu and died at her parents home here in Crawfordsville. All of these old houses have a million stories to tell and this is but one small story.The new houses are building their stories and adding them to those of the past. Yet another example of the many ways in which Wabash continues to grow and evolve over time. This is a photo that I love to share whenever I can. This is the “Senior Bench” as it is known on campus. 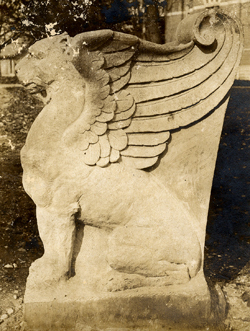 It is really the Thomson Bench, a memorial to several members of the Thomson family who played major roles in the early history of Wabash.The Thomson Bench was dedicated in 1905 and almost immediately became the exclusive property of the Senior Class. It was a custom that, in a rather serious presentation, the Bench was transferred to the rising seniors at Class Day each year. The three young men above are enjoying a sunny day on the east campus. This picture, like so many others here in the Archives, had no date or names associated with it. However, the magazine that the two men on the right are reading is so distinctive that I can say with certainty that this picture is from sometime after November 1916. 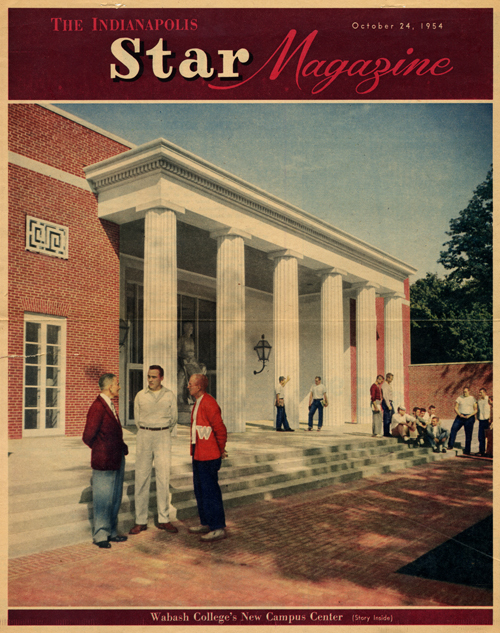 That issue of the Wabash Magazine is the only one to carry such a cover. This is a close-up of the end of the bench. I like both of these images because they show us what the Bench looked like before it was customary to paint it. That custom is now firmly established and the Bench is painted several times each year. It is not uncommon for the Bench to serve as a memorial to a lost member of the Wabash community. It was most recently painted for the passing of Bill Placher. A rather witty nod to a much dreaded, but unavoidable, rite of passage for all Wabash men, Senior Comprehensive Examinations. The Senior Bench has been a witness and a participant in 104 years of student life. It is a lightning rod for student interaction and it is a blank canvas awaiting the next message…delivered in paint.